Studio Pixel is well loved amongst games for creating the popular indie sensation, Cave Story. Built by a single man over the course of five years, Daisuke "Pixel" Amaya now has a legion of followers who enjoy his masterpiece and astonishing ability to create such a wonderful video game in his free time. Amaya and his one-man development studio have finally announced a long awaited follow-up. Gero Blaster is not quite the expansive open-world platformer most fans might have in mind, taking a much more linear run 'n gun style of gameplay, but the distinctive approach to the core elements seems to be the same. Leveling up ammunition and weapons, charming chip tunes, perfectly animated pixels, adorable enemies, even the whimsical story of a frog trying to rescue his cat girlfriend who has been abducted by aliens. Cave Story is a seriously difficult act to follow-up on, but from what the trailer shows so far, it looks like light entertainment by comparison. I'm sure it will be a wonderful game when released, and I'm also sure Ayama has put a lot of hard work into it. However, the struggles of building such a huge game by yourself are most likely impossible to replicate. 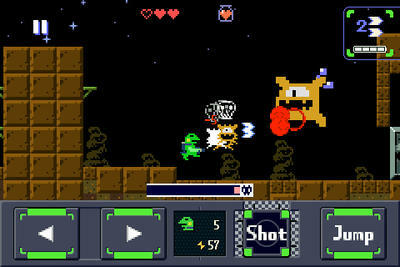 Gero Blaster will be released for the iOS market, and Nicalis is already to work on porting it to the Nintendo 3DS, much like they did Amaya's other popular games: Ikachan and Guxt.